Jamaica Tallawahs 95-1 (C Gayle 54, R Emrit 1 for 13) beat Guyana Amazon Warriors 93 all out (Sohail Tanvir 42, Imad Wasim 3 for 21) by nine wickets with 43 balls to spare. 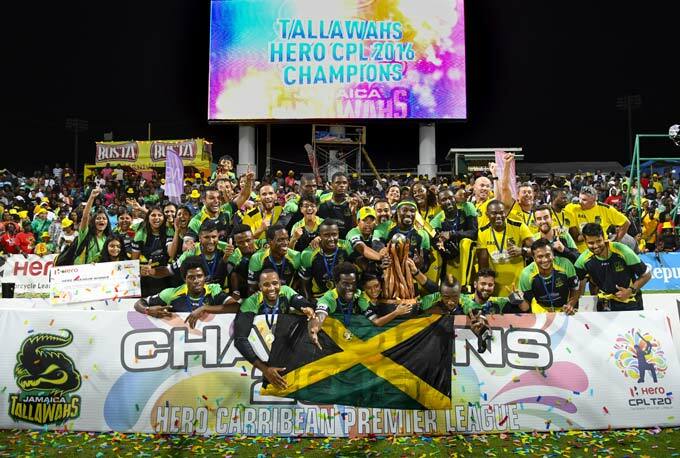 A brilliant bowling performance from the Jamaica Tallawahs saw them dismiss the Amazon Warriors for 93 in the Hero Caribbean Premier League (CPL) final to secure their second title, the first team to do so. The Amazon Warriors lost their wickets with alarming regularity as they fluffed their lines on the tournament’s biggest night. The Tallawahs finished behind the Guyana Amazon Warriors in the group stage and lost to them in the first play-off game, but in the final the Tallawahs did not give them a sniff in a fantastic all-round display that saw them win by nine wickets with 43 balls to spare. They did so thanks to a career best bowling performance from Imad Wasim and yet another Chris Gayle half century – his 78th score of fifty or more in T20 cricket. Chasing 94 to win the Tallawahs did not need to rush, but that did not stop Chris Gayle getting off the mark with a towering six off Steven Jacobs. That was an impressive beginning from Gayle, but he and his team were selective in their shot making at first. Even going at just over a run a ball inside the batting PowerPlay kept them well ahead of the rate. As the innings progressed Gayle was happier to go for the big shots as he hit back-to-back sixes off Jacobs in the final over of the PowerPlay which brought 17 runs. During the sixth over Gayle became the fourth batsman to pass 400 runs in this edition of the Hero CPL. That acceleration from Gayle continued after the fielding restrictions were relaxed as he took 18 runs off an Adam Zampa over as the Tallawahs got two thirds of the way to their target with just seven overs gone. Gayle brought up his fifty after 22 balls as he made a mockery of the target his team had been set. That patient start was quickly forgotten once he was well set as he struck 3 fours and 6 sixes on his way to 54 (27). This was the perfect performance from Gayle and his team as they became worthy Hero CPL champions, although Gayle was not there when the winning runs were struck having fallen to the bowling of Rayad Emrit as he went for another six. Instead it was Kumar Sangakkara who hit the winning runs as the Tallawahs ran on to the pitch to celebrate a superb win. It was a disastrous start from the Amazon Warriors with the bat and things didn’t really improve throughout their innings. First Nic Maddinson was out edging behind to Andre Russell for a golden duck. Then Guyana’s leading run scorer Chris Lynn cut Shakib al Hasan’s first ball into the hands of Jonathan Foo at point. Those two early wickets and some excellent Tallawahs bowling saw the Amazon Warriors creep to 34-2 off their PowerPlay overs. There was huge pressure on Dwayne Smith with the two Australian overseas players gone, and he knocked the ball around for five overs before the need to accelerate brought a big shot. Unfortunately for the Amazon Warriors that injection of attacking intent from Smith also brought about his dismissal when he was caught in the deep for 17 (22) to give Oshane Thomas his first wicket in professional cricket. When Jason Mohammad was given out to an lbw that looked to be sneaking down the Amazon Warriors were 53-4. That became 70-5 when Christopher Barnwell followed up a big Hero Maximum by smashing a ball from Imad Wasim into the hands of Chris Gayle at short midwicket and it didn’t end there as the wickets kept tumbling. The only man who stood firm was Pakistani all-rounder Sohail Tanvir who made 42 from 37 balls having been promoted to four in the order. But for him things could have been far worse for the Amazon Warriors, but when he went his side were 91-8. That soon became 91-9 the very next ball when Kesrick Williams bowled Steven Jacobs. The final wicket fell in the very next over when Adam Zampa was run out – the Amazon Warriors were 93 all out after 16.1 overs, their lowest ever total. It was never enough to secure victory as they lost in the final of the Hero CPL for the third time.